Signed Modern Mosaic Painting from Peru(2017), "Textile Mosaic"
Inspired by the ancient Inca textiles known as tocapus, Peruvian artist Miriam Chipana creates a composition that is full of culture, vibrancy, and spirit. 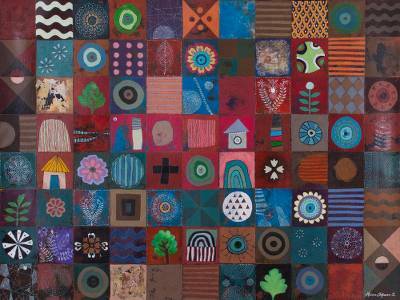 She divides the canvas into an 8x11 grid, painting each square with a unique and distinct design, such as trees, houses, flowers, and geometric shapes. Each individual component comes together to create a kaleidoscope of pre-Hispanic and modern life. Titled Mosaico textil in Spanish.